How does your lower back feel today? The number one complaint during pregnancy is low back pain. For new moms, it is definitely in the top three (right behind fatigue and mommy brain). So what causes low back pain? How do we prevent it? How do we manage it? During pregnancy (10 months!) the weight of your uterus pulls your pelvis forward into an anterior tilt. Think of your pelvis like a bowl of water and you are pouring the water out in front of you. This leads to a larger than normal curvature of your lumbar spine (lower back) called excessive lordosis. The result? A sore lower back. After baby is born, you may find it takes several weeks or even months for your pelvis to move back into a neutral position. 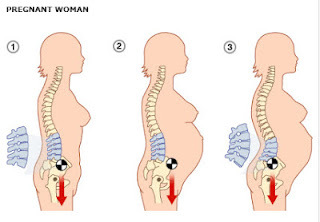 This postural shift coupled with caring for baby means many new moms suffer from chronic lower back pain as well. Here you can see a typical progression from a neutral spine to excessive lordosis. Enough of the doom and gloom. What can we do about it?! 1. Get to know your deep core muscles. Your pelvic floor and transverses abominal muscles (TVA) are key in preventing and reducing excessive lordosis. Aim for 10 pelvic floor lifts (aka Kegels) on the exhale and 10 TVA (aka belly button to spine or baby to spine) activations on the exhale 3X a day. As you get stronger, aim to contract and hold these muscles while maintaining normal breath. Click here for more info on pelvic floor. This graphic gives you a visual of the importnance of a strong pelvic floor. 2. Stretch! Spend extra time stretching your low back, hip flexor, quadricep and hamstring stretches. 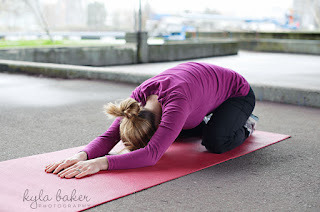 Child's pose, pictured below, is a restorative stretch that targets the lower back, thighs and glutes. With arms extended, it also lengthens the anterior deltoids and Pectorals. 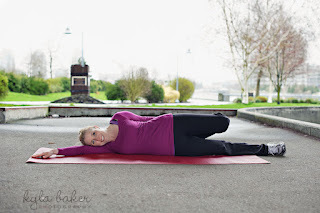 A side lying quadriceps stretch with a posterior pelvic tilt (tuck pelvis) helps to lengthen quadriceps and hip flexors. 3. Find neutral. Just like Kegels, we recommend setting certain times of day that you check in with your pelvis. For example in the elevator or each time you get up from your desk/feeding baby. Place your hands on your hips and tilt your pelvis under and back a few times before settling into neutral. A special thank you to Kyla Baker Photography and our mommy models Kait and Emma from Fit 4 Two Stroller Bootcamp.